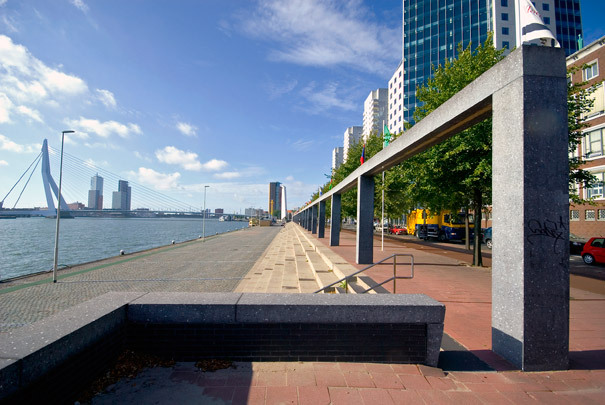 It was only when Rotterdam's central area was nearing completion that the potentials of the north bank of the Maas were recognized and exploited. Once a favoured promenade along the river, Boompjes was transformed after the war into a bustling thoroughfare. Attempts have been made to reinstate its former connection with the river by restructuring the riverside walk. This has been fitted out as a long flight of wide steps looking out across the river and crowned with a black terrazzo arcade. On one side stands Fred Carasso's 1950s monument to Dutch merchant seamen killed in the war. Halfway along the new promenade is a playful, breezily detailed restaurant pavilion designed by Mecanoo. It is an integral part of the new layout, its design relating it to harbour activities. The glass pavilion with its broad prospect of the Maas has a distinctive undulating roof.